on Thursday, November 24, at 6 pm. The gallery's new website www.galateeagallery.com will also be launched on this occasion. At the end of this November, six years after the art gallery was re-opened, Galateea Now / Document 2016 presents a synthetic panorama of the rich experience gathered during its former projects. A new mode of communication using ceramic art is being approached so that the artworks are exhibited using a video display as well; interculturality is becoming both the focal point of interest in the project and a starting point towards cultural diversities. Galateea Group, the group of ceramic artists coordinating all the activities of the gallery, initiates yearly one event consisting of an original exhibition, followed by a performance, a book launching, films or conferences on different ceramics related subjects. December 15, 16 and 17, 2016, starting with 6pm. 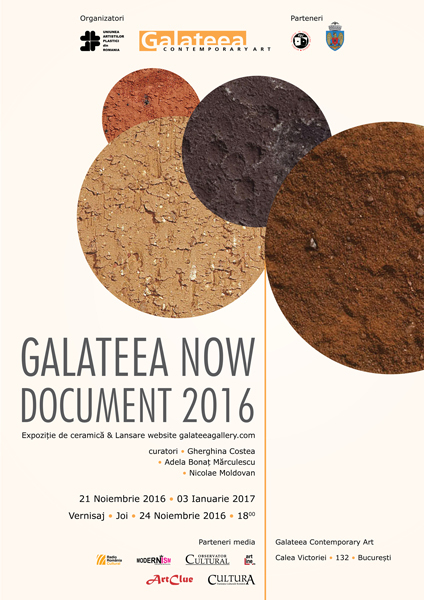 Online Galateea is a project focused on bringing all the categories of public closer to contemporary ceramic art. At the same time, one of the targets of the project is to make Romanian contemporary ceramics better known all over the world. Galateea Contemporary Art Gallery launches the site www.galateeagallery.com, as a major impact media instrument powered by Weebly.com – one of the most efficient webdesign platforms at international level, with more than 40 million users. With a minimalistic web-design architecture, the new site of the Galateea Gallery is well organized, with a clear segmentation of the main sections of interest in contemporary ceramics: Artists, Exhibitions, Events, News, Connections and the Contact page. A bilingual (Romanian–English) site fully responsive for viewing the pages both on the desktop or laptop as well as on smartphone or tablet. Its easy connection with the social media networks is a real added value. Thursday, November 24, 2016, after the opening of the DOCUMENT 2016 exhibition.